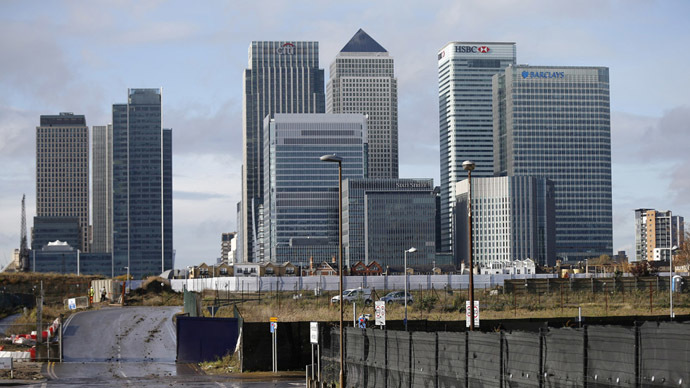 Britain’s financial system is “extremely” vulnerable to future crisis under current regulations, a new report warns. The New Economics Foundation (NEF) says the UK’s banking industry is the least resilient of all G7 nations. The report warns the resilience of Britain’s financial system has only slightly improved since the 2008 crisis. The NEF calls for sweeping changes to the UK’s banking sector, including the introduction of more competition, separating retail banks from investment banks and encouraging peer-to-peer lending. Britain lags far behind all other members of the G7 group of major advanced economies in terms of financial resilience, the report found. NEF ranked Germany as the group’s most financially resilient, followed by Japan, France, Italy, Canada, the USA and the UK. Germany was given a resilience rating of 73 out of 100, while the UK scored 27. The US was the next worst ranked country, scoring 56 out of 100. NEF focused on banking in particular, because its activities pose a unique risk to greater financial resilience. NEF’s report, titled Financial System Resilience Index, found the UK’s financial resilience dropped significantly in the early 2000s. Despite a small improvement since 2008, Britain is still not close to bridging the gap with its nearest competitors. “Our financial system is excessively large compared to the real economy and highly exposed on both the asset and liability side to the shadow banking system,” he said. Ryan-Collins said the government has not done enough to reform banks since the 2008 crash. “Serious structural reform, such as breaking up the big banks in to regional SME-focused banks, is required to create a stronger financial system,” he added. Toby Greenham, Head of Economy and Finance at the New Economics Foundation (NEF) said in a statement: “Without real structural reform, we remain extremely vulnerable to future financial storms. “Yet even the limited progress made since 2008 now seems at risk of being unpicked by lobbying from the big banks. “Far from being done and dusted, banking reform is serious unfinished business for the new government and there can be absolutely no room for complacency,” he added. Regulatory changes brought in since the crisis include requiring banks to hold more capital and erecting a ‘ring-fence’ separating retail and investment arms. These new regulations are at risk due to lobbying from the banking industry, Greenham said. Burke proposed full nationalization in order to bring the banks under control. NEF call on regulatory bodies to separate high street banks from investment banks, a policy US President Franklin D. Roosevelt carried out during the Great Depression. They also advise promoting bank diversity by increasing competition in the sector and encouraging peer-to-peer lending, where savers loan money directly to individuals or small businesses. “Without serious and concerted action, we risk sleepwalking into another financial crisis,” he said.